The micro-friends, and Nok, are on a school trip to the woods. They shrink for some micro-fun, and find a strange-looking object hidden in some leaves. Find out what they discover in An Amazing Find. The friends find themselves on board Nok's lost spaceship, the Excelsa. Tiger presses a button and the ship takes off! Find out where it's taking them in Blast Off! In Don't Press the Buttons!, Nok shows the friends the ship's fabricator. It makes them some cool, new spacesuits, but what else it can do The ship is flying through space when they see a huge rock. As they get closer, it starts to move! 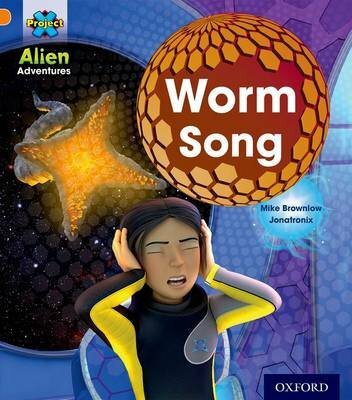 Find out what they have awoken in Worm Song. In Spacewalk the ship has flown close to a wormhole and has been damaged. Can Max and Tiger repair the ship before it's swallowed by the wormhole? The Excelsa is swallowed by a junk cruncher. Can they find a way to escape before they are squashed flat by the metal pounders? Find out in The Junk Cruncher. Each book comes with notes on the inside front and back covers for teachers, TAs and parents/carers, which give question prompts and points for discussion, phonic practice words, challenge words, and additional activities that children can do.